Ra's al Khaymah (also Ras al-Khaimah), located at the north end of the coast of the Arabian Gulf, is one of the seven United Arab Emirates (UAE). Rams - a small town with a rich tradition and culture. In the past Rams was a town of pearl divers and fishermen. A small harbour, beaches and bird-watching spots are the main attractions of Rams. Al Jazirah Al Hamra – known for having the best preserved traditional fisherman village in the UAE, nowadays it also has a new residential area with numerous real estate projects, Ice Land Water Park and industrial zone. Sham - a town near the border with Musandam. It is worth to visit for its interesting old wadi settlements, rock engravings and harbour. Ras Al Khaimah is nestled between the Hajjar Mountains on the East and the Persian Gulf on the West and shares mountainous borders with the Sultanate of Oman. With the completion of the new Emirates Highway, RAK is only about one hour from the emirate of Dubai. H.H. Sheikh Saqr bin Mohammed Al Qasimi has been the Ruler of Ras Al Khaimah since 1948. His son, H.H. Sheikh Saud bin Saqr Al Qasimi was appointed Crown Prince and Deputy Ruler in June 2003. The Emirate Ras Al Khaimah combines a fascinating and a relaxing tourist hub with its calm blue seas with clean white beaches, dramatic desert dunes and the majestic Hajjar Mountains. It has numerous fascinating tourist landmarks, beautiful wildlife conservations and sanctuaries. Golf has become one of the leading tourist attractions within the emirate. Citizens of the following countries receive a free of charge visit visa upon arrival: Andorra, Australia, Austria, Bahrain, Belgium, Brunei, Denmark, Finland, France, Germany, Greece, Hong Kong, Iceland, Ireland, Italy, Japan, Kuwait, Liechtenstein, Luxembourg, Malaysia, Monaco, the Netherlands, New Zealand, Norway, Oman, Portugal, Qatar, San Marino, Saudi Arabia, Singapore, South Korea, Spain, Sweden, Switzerland, United Kingdom, United States, and Vatican City. All other nationalities - including, as of 2011, Canada - need to pre-arrange their visas. To receive a visit visa you need a sponsor (a hotel, travel agency, company, UAE resident, or a UAE embassy) that will arrange the visa for you and be responsible for you during your stay in the UAE. A basic tourist visa, where a hotel or travel agency are a sponsor, costs 100dhs (27US$) for 30dhs. Most of the other visit visas cost 500dhs (135US$) for 30days or 1,000dhs (275US$) for 90days. The UAE visas are usually valid for two months from the date of issue and allow entry to the UAE only one time within this period. The Ras Al Khaimah International Airport , called RAK Airport is situated 20-minutes from the city centre. To get there you need to take a taxi, which always run by meter and should cost you around 30dhs from the centre. If you are staying in one of the hotels in Ras Al Khaimah, you can also arrange for a hotel pick up. The national carrier is RAK Airways, that serves Dhaka and Chittagong Patenga in Bangladesh, Jeddah in Saudi Arabia, Kozhikode in India and to Cairo in Egypt. Only Oman Air and charter airlines serve the airport. Other Airports are 80km (Sharjah), 90km (Dubai) and 240km (Abu Dhabi) from Ras Al Khaimah. There is no railway system in Ras Al Khaimah or the UAE. Ras Al Khaimah has a border with Oman (Musandam). It is rather easy to enter and exit the country by car. Ras Al Khaimah has road connections with all the other emirates. The Emirates Road (E311) allows reaching Umm Al Quwain (UAQ) in half an hour, Sharjah in less than an hour, Dubai in 1 – 1.5 hour (depending on the traffic) and Abu Dhabi in around 2.5 – 3 hours. The old Coastal Road (E11) is slower but takes you directly to Sharjah via UAQ and Ajman. Fujairah can be reached via the mountain passage or via Masafi (E18) in about 1-1.5hour. There is daily modern bus service to Umm Al Quwain, Ajman, Sharjah and Dubai. The buses usually leave every hour from the RAK Public Taxi and Bust Stand (Al Faisal Rd, opp. The Cove Rotana) from around 7am until 8pm. One way tickets cost: 10dhs UAQ, 15dhs Ajman, 25dhs Sharjah and 25dhs Dubai. Currently, there are no passenger boat carriers operating directly to Ras Al Khaimah. A few tour operators (mainly in the international hotels) organize Ras Al Khaimah city tours. Most of the big hotels provide buses for their guests to the RAK Old City and shopping malls. Taxis or rental car are your only option to move around Ras Al Khaimah. Taxis use meters, are reasonably priced, easily available and honest. You can pre-book a taxi 800 1 700 or just flag one on the street; it should not take more than a few minutes to find a taxi. Car rental is easily available option. Most of the roads in Ras Al Khaimah are in good condition and it is easy to find the way around (at least in the city). However, driving can be a challenging experience for those who are not used to slightly chaotic roads. International car rentals are available in most of the hotels. There are also numerous smaller local companies around the town. You should expect to pay from 150dhs for a small car per day. Walking around Ras Al Khaimah is not easy due to the traffic, lack of sidewalks and zebra crossings and it is something not done and not recommended. For a pleasure walk, Corniche Road and beaches are the best and safest option. Although the RAK Transport Authority has made plans to run buses within Ras Al Khaimah, so far no public buses are available. Ras Al Khaimah Old City - the oldest residential area in the city of Ras Al Khaimah with an old souq, old mosque, fishing harbour and Al Hisn Fort, which now host RAK National Museum. Ras Al Khaimah National Museum - the RAK National Museum is situated in Al Hisn Fort. It presents the history and culture of Ras Al Khaimah. Dhow Building Station – continuation of a long Ras Al Khaimah’s tradition of dhow building. Camel Race Track – taste of the Arabic heritage with excitement of the race. 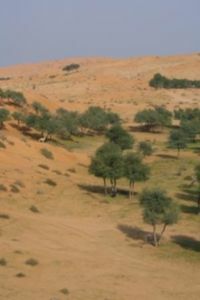 Prehistoric Shimal – one of the oldest settlements not only in Ras Al Khaimah but also in the region, it has remains of numerous ancient constructions such as Umm an-Nar tombs (2600-2000BC), Wadi Suq tombs (2000-1600BC), a second millennium BC settlement, findings from the Sassanian period (300-632AD) and the Abbasid era (750-1250AD). Sheeba’s Palace – the remains of the 16th century palace. Wadi Haqil – a large wadi, which up to the 1970s was a centre of pottery production started in the 15th century. Dhayah – a village that has remains of old tombs and settlements. It is mostly known for its hill top fort that was a last point of defence against the British who attacked Ras Al Khaimah in the 19th century. Ghalilah Village and Wadi – their main attractions include famous Stairway to Heaven track, ancient tomb, heritage village and fishermen houses. Sha’am – a town near the border with Musandam. It is worth to visit for its interesting old wadi settlements, rock engravings and small harbour. Wadi Bih – it is one of the picturesque wadis in the UAE. It has remains of old settlements, graveyards and breath taking scenery. In one of the tributary wadis, the Jebel Al Jais Mountain Resort is constructed. Falayah Fort – an old summer residence of the sheiks of Ras Al Khaimah. The General Treaty of Peace between the British and the local sheiks was signed there. Khatt – an oasis with thermal waters and numerous archaeological sites. Al Jazirah Al Hamra - the best-preserved fishermen village in the UAE. Southern Wadis - Wadi Asimah, Daftah, Munay’i, Shawka, Qawr, Safarfir – full of prehistoric sites, scenic and yet undeveloped. Fishing - Ras Al Khaimah offers the richest fishing experience on the east coast of the UAE. Unlike Dubai, there are very few fishing charter operators and practically no commercial fishing. The most common catch is barracuda, tuna and king fish. Due to the rather flat topography, most of the fish is caught trolling, versus bottom fishing. Ice land Waterpark - it offers more than 50 rides and numerous water games. Saqr Park - the Saqr Park is the Emirate’s biggest public park. It has some slides, electrical cars, computer games and other attractions for the young ones. Camel race track – camel race is an attraction not to be missed. The races take place on Fridays, early in the morning from October till March. Camping and picnicking – done everywhere, although maintains are particularly popular for camping and beach, Saqr Park, Corniche Road and Emirates Road are often chosen for picnicking. Golf – there are two golf clubs in Ras Al Khaimah. Tower Links Golf Club (18 hole) and Al Hamra Golf Club (9 hole). Shisha Café’s – a rather relaxing and very local experience. Many restaurants offer shisha, and Corniche Road seems to be particularly popular. Wadi bashing – Ras Al Khaimah has a wonderful mountains which are often visited by residents and tourists. A 4WD is a must. Quad biking – popular activity amongst the local community, bikes can be rented at the Awafi desert area. Desert safaris – organized by most of the hotels. Cinemas - there are two cinemas in Ras Al Khaimah: Grand Manar (07 2278888) with mainly English speaking movies and Gulf Cinema (07 2223313) with a range of Indian and Arabic movies. A brand new cinema is under construction at the Al Hamra Mall which will mainly feature English box office movies. Corniche Road – it is one of the most popular places in Ras Al Khaimah, a centre of all action. It is a long street by the RAK Creek with a green promenade, attended mostly on the weekends. Picnics, jogging, roller-skating, biking are only few activities and sports that take place there. Old Souq – old souq is not that old, but it is the most traditional shopping experience you can get in Ras Al Khaimah. Al Nakheel – it is a district with numerous small shops. Because, numerous of these shops sell Indian products and there is a large Indian community living in this area, Al Nakheel is called by some a small India. Fish Market – interesting cultural experience and a chance to see a local sea life. Shopping Malls – apart from smaller shops and shopping centres, there are four shopping malls in Ras Al Khaimah with Manar Mall  being the most popular. Others are: RAK Mall , Al Hamra Mall  and Safeer Mall . A typical Emirati food is not widely available but it can be found in so call ‘popular kitchen’ types of restaurants. Lebanese cuisine mixed with some Arabic and Indian influences is often considered a local food. What you can expect in the restaurant is traditional Lebanese mezze (hummos, mutabal, salads, falafel), kebabs, biryani, fish, or lamb. Ras Al Khaimah's different cultures brought different tastes for food, and restaurants of many types and origins are opened in the city. Considering a large number of Indians in Ras Al Khaimah, there are plenty of great Indian restaurants. All major international fast food restaurants chains are also present in Ras Al Khaimah and there are numerous local fast food bars. Vegetarians will be please to know that in most of the restaurants have at least one vegetarian option, there are also a few purely vegetarian restaurants in town and the concept is widely understood. Arabic coffee and tea are available almost everywhere. So are the juices made from freshly squeezed fruits. Alcohol you can get only in the hotels, although you can buy it for your private use. This page was last edited on 22 February 2016, at 11:39.